Every Monday the children of Colegio Bethel start the week singing songs of worship led by Pastor Emilio. All of the children are aligned in columns by class with the youngest to the left and oldest to the right, which provides for a very organized presentation. There was seriousness but also many smiles as Pastor Emilio deftly played the keyboard smoothly transitioning from one song to the next. The vibrato of his baritone voice carried effortlessly across the tiled walkways and paved school yard; I doubt he even needed the supplied microphone. The children’s enthusiasm boosted our spirits as they clapped and sang. We took a moment to perform a song we had worked on all week led by the husband and wife team of Mike and Jennie. The kids faced beamed back at us in surprise and maybe a bit of empathy as we had just traded places. We then headed to the cafeteria for a quick breakfast of cornflakes and steaming hot sausage and egg burritos before patient care started for the day. Jenny led our devotion that morning and tied together a great narrative discussing peace. She explained that peace of mind and heart, peace in action comes as a result of faith and that God intends for us to be peaceful and have peace in our lives by leaning on him. I heard someone explain later that they felt serenity even in her delivery, which I must admit was very true. Afterwards, on our way to the clinic, I noticed patients already seated outside on plastic chairs patiently waiting in line for both the medical and dental teams. With all of our preparation done we quickly transitioned into patient care mode with many conversations taking place all at once. At every unit we had a dentist, an assistant and a translator. We also had a coordinator seating patients and doing her best to keep us all on a timeline. The sterilization area seemed to hum with efficiency and organization and a few us were floating to address any issue that arose . This year was the first year that a dental hygienist made the trip and it was clear from the start she had some serious work to do. In total, I believe we had 17 people effectively working together to process patients through 4 dental treatment stations. 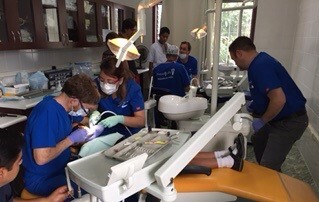 The constant buzz of English and Spanish being translated back and forth along with the clamor of instruments and suction hissing in the background must have been quite overwhelming for the youngest of children who have never seen a dentist before. And for the elderly too, as the clinic is open to all who visit from San Pedro and the surrounding villages in the mountains. I should also mention the medical portion of the clinic on the first floor where a family doctor and an ENT Specialist were kept busy with back to back patients for the entire day. They had a similar support team of translators, pharmacy volunteers and sterilization. In all cases, the teamwork and cooperation was very impressive. Our first day in the clinic was altogether shocking and emotional, both for some of our patients and for myself. The level of compassion I witnessed may have only been surpassed by the empathy I felt deep inside for our patients, many of whom would leave in less pain and discomfort than when they arrived. By days end we were all quite exhausted from the effort, emotion and humidity in the clinic. We spent an hour that night learning of the Mayan heritage of the surrounding areas which was quite intriguing and yet sad as well. Pastor Emilio, a direct Mayan descendant, and his daughter taught the class. After a long day and an hour on the history of the local culture we were completely famished. To our surprise the kitchen staff at the school had made pizza! What a smell and a sight as Kyle and Susanna’s daughters, also volunteers on the trip with us, carried out extra large pizza trays holding a variety of pies. Needless to say, we all ate our fill and slept well that evening.